Welcome to Epoxy Superstore. We sell epoxy floor paint, industrial coatings, floor prep tools, and application tools for coating professionals as well as DIY homeowners working on a garage floor. To head to our webstore, click the 'To Webstore' button above. If you are a contractor looking for industrial and commercial coatings, we have 100% solids epoxy, abatement encapsulants, and trusted high performance brands such as Fiberlock, Norklad, and Devoe. 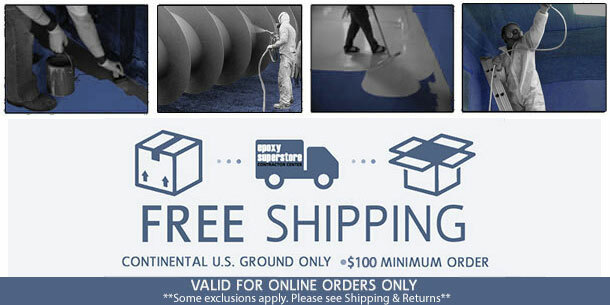 We offer free shipping over $100, ideal for bulk orders. If you are a homeowner looking to coat your garage floor with epoxy paint, consider water based epoxy as it is easy to use and can be applied with a roller. With some floor flakes and a clear coat, you will have a professional looking floor paint coating. What Kind Of Product Brands Does Epoxy Superstore Supply? We are here to help you achieve the concrete floor surface of your dreams. Our floor and wall coatings adhere well to surfaces such as concrete, metal, tiles, wood, drywall. The process is simple. First, prepare your floor with a concrete etcher. For small projects, use Etch n' Clean. For large projects, consider a floor grinder. This must be done in order for the coating to penetrate or adhere to the surface. Next, apply your base coat. For first-timers, we suggest water based epoxy like Norklad WB because it is easily applied with a roller. For experts, we carry a wide array of industrial epoxies including 100% solids. For basic projects, you can stop here, but you may also want to apply a clear coat for maximum attractiveness and protection. If you are applying color chips or metallic mica flakes, sprinkle them on your base coat before applying the clear coat. This can be epoxy or one of our aliphatic urethanes. If you are looking for more detailed instructions, visit our instruction guide. Please visit our sister site www.originalcolorchips.com for more information on our floor coating systems including videos, photo galleries and more. Looking for a unique Metallic Epoxy Floor Kit? 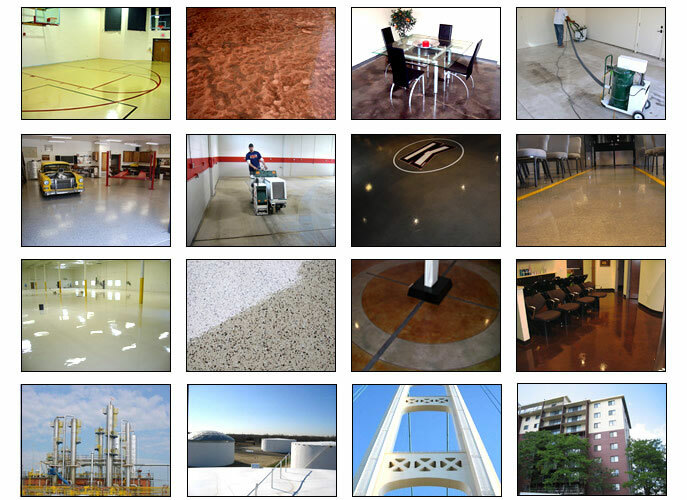 Be sure to visit our Pure Metallic Epoxy Floor Coating website at www.puremetallic.com.